Location-data management specialist Navads now enables marketers to extend and update their business profile data to Uber and Waze Maps. This completes Navads ecosystem to a network of 10 mapping and navigation sites such as Google and Apple Maps. Amsterdam-based location data management solutions provider Navads, announced that it has added Uber and Waze to its existing publishing network consisting of the largest map-makers in the industry including Apple, TomTom, HERE and Google. Through this addition, Navads has extended the breadth of publication for their customers’ location data to these two global map providers. And with this, marketers can ensure that the location data that is presented to both the 65 million active Waze users as well as the 40 million active Uber users, is accurate and consistent. With the addition of Waze and Uber to the Navads publishing network, the benefit is two-fold. In one instance, the location data in these two global applications will become more accurate, offering a better experience to their users. Additionally, marketers will be able to keep using Navads as their single point of contact for managing all their location data, and can now present that up-to-date data across even more apps and devices, to a wider set of potential customers. Waze is currently the largest navigation app in the Southern European countries with 65 million users each month from a total of 185 countries. By presenting the right location data to Waze users on a global scale, businesses can eliminate the risk of losing customer visits due to inaccurate business location content, and thus prevent their locations from losing revenue. Uber is one of the largest location data aggregators globally and currently has 40 million active users from 76 countries. On May 20, 2017 they recorded 5 billion rides per year spanning 6 continents. To ensure optimal user experience, it is crucial for Uber to have the most up-to-date information of business locations selected by Uber users as the pick-up and destination locations. Navads is continuously adding map and navigation providers such as Uber and Waze to their already extensive publishing network. These close integrations are part of Navads’ international approach and align with the company’s mission to become the preferred platform for business location data. Navads’ platform also serves as the back end to white label agency resellers to serve their clients as well as enterprise fuel retail corporations to ensure their locations are in optimal visibility. Navads is the leading provider of location content to the mapping databases that power the navigation and mapping industry. 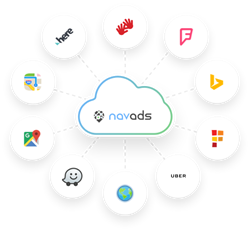 Through strategic relationships with the principal map development companies, including Google, Apple, TomTom and HERE, Navads offers a single-source service to ensure that location content is pushed directly into the core mapping databases of named map providers. With extensive experience in the location marketing arena, Navads helps customers achieve optimal visibility in mainstream navigation devices, today and in the future. Founded in 2006, Navads services many of the Fortune 500 corporations and four out of five global fuel retail organizations.